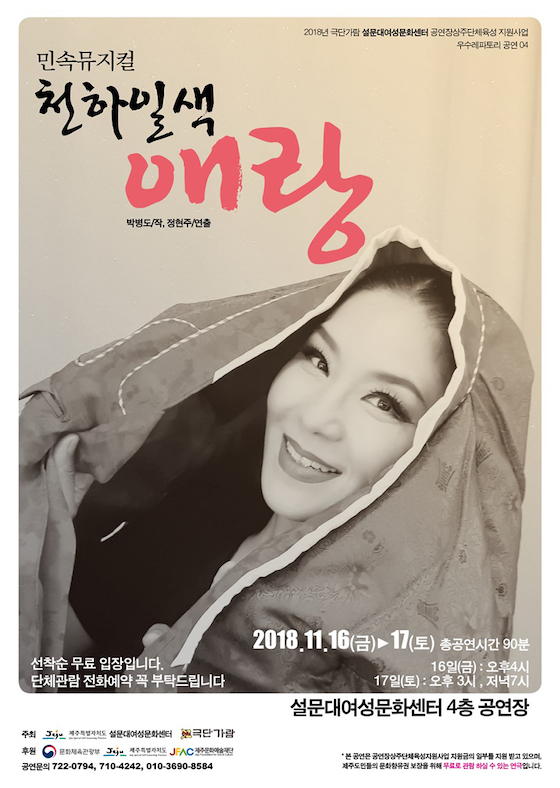 The Korean folk musical performed by Park Byeong-do,Jeong Hyeon-ju and Yeon-yeon will be held on November 16 (4:00 p.m.)~ 17 (3:00 p.m./7:00 p.m.). The musical will be held at the concert hall on the fourth floor of the Seolmundea Women's Culture Center. As part of the monthly art and cultural project, the folk musical 'Cheonhailsek Aerang' writen by Park Byung-do will be on screen this month. This musical is the remake verson of "Baebi Jangjeon," which is called Korea's first musical, with Jeju lady as the main character and Jeju Island as background. During the performance, you can enjoy the beautiful lines and songs in Jeju language.